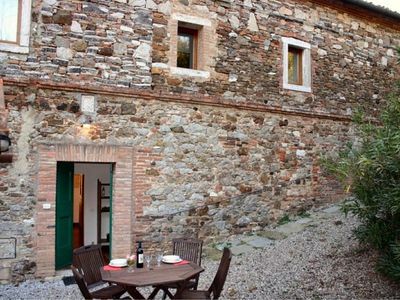 Villa Beata F is a welcoming two-story independent house in the characteristic style of the Tuscan countryside. It sleeps five people. From Villa Beata F you will enjoy a pleasant view of the Tuscan countryside. 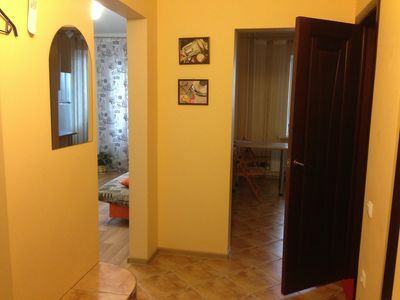 Villa Beata F is 150 square meters (1615 square feet). It features a shared swimming pool, a shared garden and a reserved outdoor area. You will be roughly 1 km (0.6 miles) from Rapolano Terme, where you will find restaurants and shops. You will reach Villa Beata F from the parking area along a walkway that cuts through the garden. To stay at Villa Beata F you will need a car. You will be able to park it on the premises, in a reserved parking space. Villa Beata F is one of the holiday homes available in a small complex. Please find a general description of the complex below, and please scroll further down for a description of Villa Beata F.
You will spend your vacation in an ancient, typical Tuscan farming village, near the summit of a small hill, 350 meters (roughly 1150 feet) above sea level. The hamlet consists of six stone buildings, distributed around a large villa dating back to the 1600s. Today, though, they have been renovated into five apartments, also used for vacation rentals. The villa and the surrounding land, as far as you can see, have belonged for centuries to an ancient family of Tuscan Counts, and are still part of a single large agricultural estate. All around you, you will see land planted with rows of grapevines, alternating with areas that have been cultivated with olive trees. In the distance, the foliage of a small oak forest interrupts the cultivated landscape. And it is in this peaceful setting that you will spend your vacation! As you stretch out in the sunshine, your view scans across an uninterrupted horizon of gentle hills covered with vegetation, or comes to rest on the simple and elegant architecture of the complex. The small hamlet is at the center of a large agricultural estate, of 300 hectares (about 740 acres), and during your stay at the complex you will be guests of this estate. The estate produces a famous wine and olive oil, and you will be able to acquire these products, among others, during your stay. Upon request, you can also visit the winery of the estate. The swimming pool is 7 meters (23 feet) large by 14 meters (46 feet) long. The swimming pool area is equipped with chairs, sun umbrellas and sun loungers. From the swimming pool you will enjoy a broad view of the surrounding countryside. You will share the pool with the other guests staying at the complex. It is open from mid-May until mid-September. The garden is partly shaded by trees. It is equipped with a table and chairs. Here you will also find a brickwork barbecue. From the garden you will enjoy a pleasant view of the Tuscan countryside. You will share the garden with the other guests staying at the complex. The living room is paved with Tuscan terracotta tiles. The furnishings are simple and comfortable. The furnishings include a divan bed for one guest. There is a practical fireplace made of bricks. The dining table can accommodate four guests. In this room you will find a satellite television. From the living room you will be able to enter the garden through a French door. The room also has two windows with a view of the garden. You will be able to enter the kitchen from the living room. 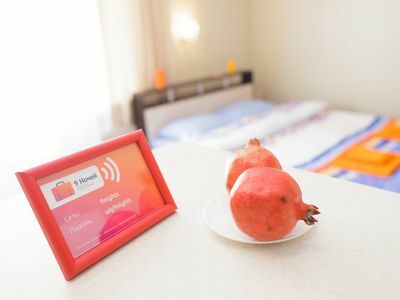 It is equipped with a four-burner gas cooker, an electric oven, a refrigerator with freezer, an Italian-style coffee-maker and other small appliances. The kitchen has a window. You will be able to enter the first bedroom from the through a corridor. The bedroom has a matrimonial bed (160 cm/62 inches, wider than a queen-size bed). The room has two windows. You will be able to enter the second bedroom from the through a corridor. 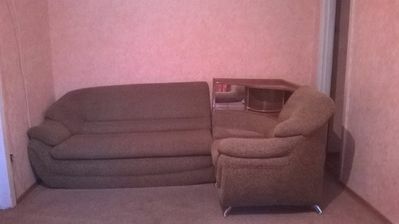 It has two twin beds (80 cm/32 inches). The room has two windows. Security Deposit required, please check details at time of booking. 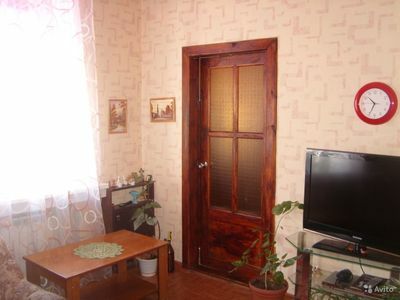 1 room apartment on Papanina street 18. 1 room apartment. 8 Marta 190. Bus st.
Panorama park. 1st line of the seaside.